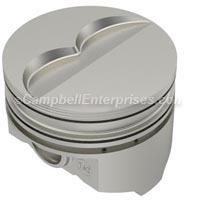 High performance KB hypereutectic Mopar 383 pistons offer a significant performance improvement for your engine, at a very affordable price. We have these piston sets available in a wide range of sizes including standard bore and 4 different oversizes. 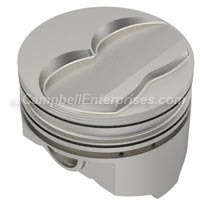 If you are rebuilding a Chrysler, Plymouth or Dodge 383 engine and are looking for improved performance, without the higher cost of forged pistons, KB performance pistons are an excellent alternative for many street, muscle car restoration, cruising and street / strip engines. Shipping in the USA for this item is only $14.95 when you spend $380.00 or more! Eagle is well known for their high quality steel H beam connecting rods. Eagle products are found in everything from serious Mopar, Chrysler, Dodge and Plymouth street cars, to hot street strip cars, to all out drag, oval and road racing engines. Eagle rods are far stronger than the stock original rods. 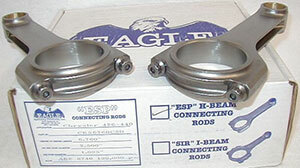 Eagle H beam connecting rods are manufactured from a TWO-PIECE FORGING. The forging process forces the grain into the shape of a connecting rod, resulting in a superior fatigue life. The rod cap is forged separately so that the grain runs perpendicular to the load forces, which strengthens the rod. Eagle H rods are forged from 4340 grade steel and although it is a more expensive process, all ESP Eagle rods also include a higher content of nickel and chrome, which increases the strength and fatigue life without making the connecting rod brittle. If you compare the price of magnafluxing, reconditioning and installing new ARP bolts (this should be done even if you use the stock rods, as the original stock rod bolts are the weakest link) into an old set of stock rods to the exceptional value of a set of modern, far stronger Eagle rods the choice is pretty clear. Upgrade to new rods, rather than spending money on old, weaker OEM production rods. Precision Alignment Sleeves positively locate the rod cap, maintaining big end bore size and eliminating cap walk. If you do not see a set of Mopar 383 pistons with the specifications you need, please contact us and we will be happy to help you. We have many other pistons, rods and cranks available for these engines.